Traditional celebrations were held in India on Aug 5, for the first time Chander missed the event. I tied two strings on his wrist, one for each of his sisters who usually perform this ritual. 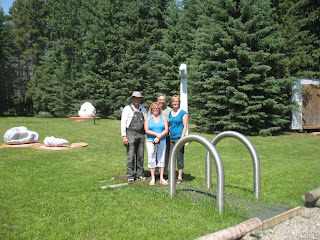 On Wednesday evening a local couple came out for the tour of the site and gallery. We all had a really nice time. They enjoyed having a little more information about some of the art works in the gallery, the tools we use to shape the stone and the chance to talk to the artists. Next Wed evening there will be another tour from 7-8, everyone is welcome. It warmed up on Thursday afternoon but in the morning it was chilly. It must be a big shock for Chander, Gerard and Chien to work here coming from such hot climates. When Chander was in New Delhi on his way here the temperature was 46 C. He thinks it is very cold here now, -40 is another story all together. 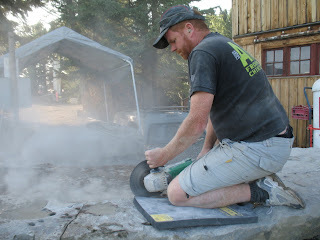 After getting the stone on the ground Paul cut frets in the lump that had to come off of the bottom side of the base. 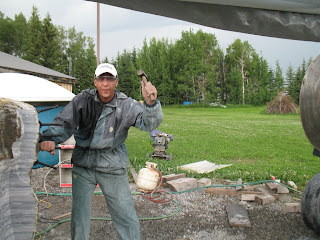 It had finally warmed up and he decided to forgo the rain gear we often wear when cutting "wet". Boys like to play in the mud. 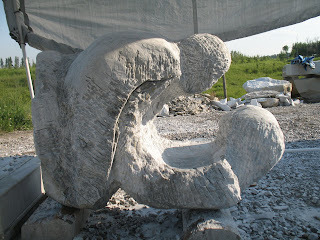 Chien's sculpture, "Spring" has been rolled over as he is working the sides. 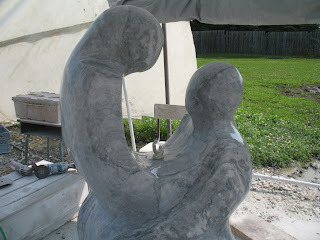 Now that the form on the front is laid out he will shape the sides and back before starting to polish. Bergen Rocks 09, Aug 5 On the evening of Aug 3 a terrific storm began about 1am. This was a storm like many people who live in our area have never seen before, the lightning was so constant that it was like daylight for about 15 minutes. The hail and wind was incredible, the radio reported that there was extensive damage along a 150km strip from Red Deer to Airdrie. 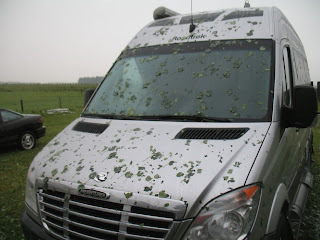 This van is covered with leaves knocked off of poplar trees about 100 yards away. The site is a mini disaster area in itself, tents are toppled, one is even in the creek beside the site. The storm took out power poles and lines around the area, on Monday morning there was no power and likely that it would be a few hours before it is restored. 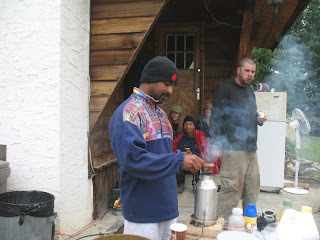 We boiled water for coffee in a Kelly Kettle, using wood for the heat. Cooked breakfast on the BBQ. It was chilly so we were all dressed a little bit heavier than we should need at the begining of August. It seemed like it was a little to cold to work and since the power was off, after breakfast we loaded into a couple of vehicles and headed for Drumheller. We usually take Tuesdays off but I'm sure anyone coming to the site will understand that we can't work until the power is restored. A volunteer from Calgary stayed behind to let people that do come out know what is happening today. 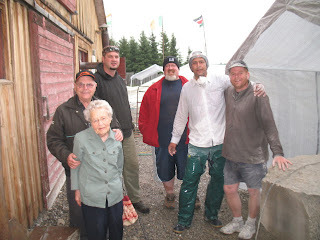 Over the weekend volunteers from Edmonton, Biesieker, Calgary were on hand to help out. We couldn't do it without them. I'm really pleased that we can hold the symposium in Bergen and create some benefit for the local area by attracting visitors here. 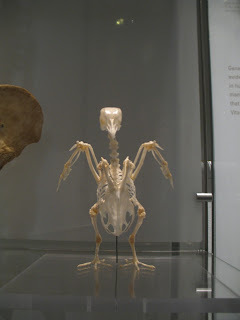 Royal Tyrell Museum is incredible!! 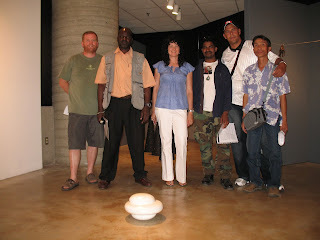 Volunteers split up at the museum and stuck with one of the sculptors so they could wander about where ever they liked,. that worked out well. After the museum we had lunch and went on to the little saloon in Wayne. That pretty much filled up our day, two hours drive back home. I think I mentioned that the volunteers are awesome. 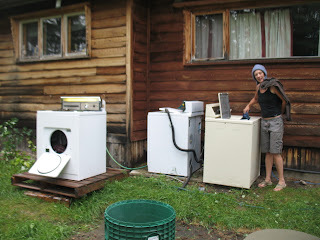 Robin Webster from Calgary washes clothes in the outdoor facility. In order to create another bedroom the washer and drier are moved out of the house during the symposium. The guys are cooking thier own breakfast, washing thier own clothes and taking turns helping to clean up the kitchen after meals. This is certainly unusual for an event that is usually sponsored by the government of a country, province or city in other countries. 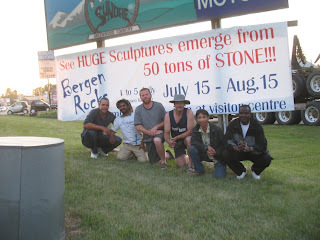 Bergen Rocks certainly is a grass roots event, everyone chips in and we get to do our art. It's not only the volunteers that are pitching in, after coffee time in the barn we help to clean up before getting back to work. As we have only one cook we really try to help out where we can, and the sculptors are helping each other moving the big saw and their stones etc. This certainly makes our event unique. 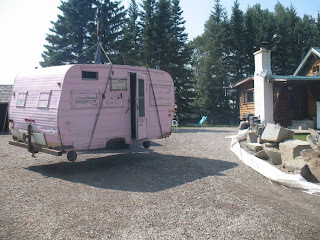 My neighbor, Ed Stacey came over in the afternoon with "Bergen Sven" and one of his wagons. Ed has about fifteen of these beautiful horses (Norwegion Fjords). 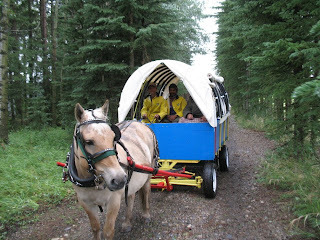 Chien got a thrill out of driving the wagon, it was still cold out today and no break in the weather that we can see. 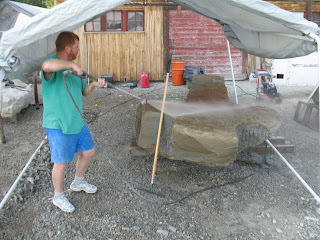 After warming up in the barn after the wagon ride it was back to work on the stone. The wood stove in the barn is great for warming up on chilly days like this, really it is nessecary. When you get chilled to the bone there is nothing like the heat from a roaring wood stove to warm you back up again. 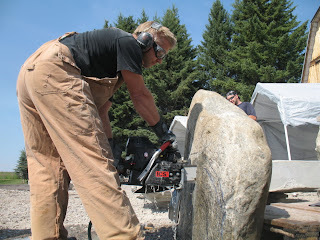 On Aug 1 & 2 Stephen Yettaw, sculptor from Edmonton, brought out his stone cutting chain saw and created a sculpture over the two days as well as letting all the guys try the machine and making a few cuts on Carlos' piece. 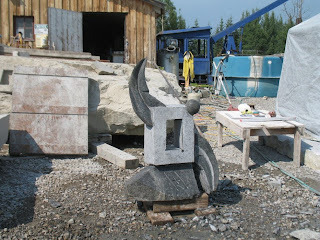 This is the sculpture Stephen did, it is solid granite. The chainsaw is a great tool, the negative space in the centre was made quickly, it would be a big job with other tools. Stephen cut the space between the two figures for Carlos. This was a big time saver for him, it will let him start shaping the torsos of "Prelude" about a day sooner. Chien finished working on the front of "Spring", we rolled it onto it's side and made a cut along the back, then rolled it another 1/2 turn and cut again from the other side. "Desire to be" is more polished every day. 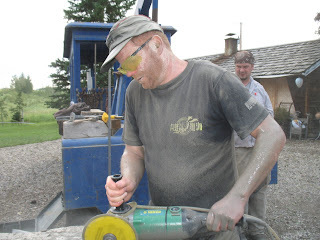 Gerard ground it as smooth as he could then started sanding starting with 40 grit and moving up to 200. He will graduate to finer and finer sanding paper up to about 1500 or more. It will shine like glass at that point. Extra volunteers showed up on Friday and we had a chance to get the things done aound the site that have been hanging over our heads. 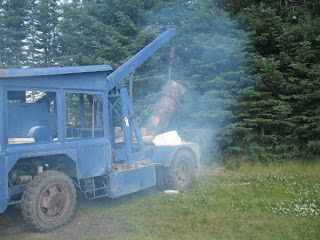 Here we pick up a big log to use for the signs showing the distances to where the sculptors came from. 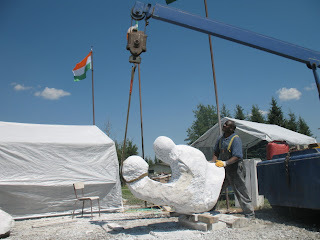 And here it is, the sculptors will have traveled more than 115,000km to be here and make their art for us. Kenya is the distance winner at 14,195 km one way! 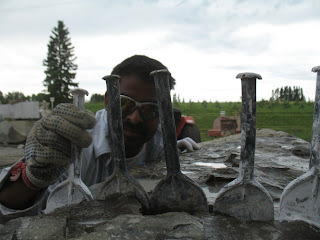 Chander will use 7 iron bells rather than the stone ones he had in mind before he started. He cut designs into them with a gas cutting torch, it is going to a beautiful piece, and include an element of sound!! At the reception last night in Olds Carlos met some spanish speaking people Richmond and Roser Godfry, they invited him to spend the night with them to visit the family. They live quite near to Bergen, they arrived bright and early the next day and will be back to visit some more through the next two weeks. 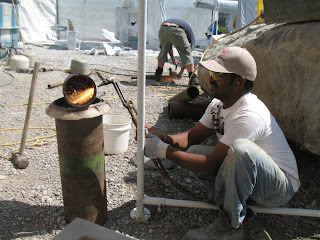 Mark returned to the site today and cut some material for Chander, Here chander is shaping some of it carefully. As you work closer to the finished surface fret cuts get smaller and closer together, eventually grinding and then sanding will create a mirrror smooth finish. Gerard has his form and has ground most of it smooth. Now he is moving to polishing. Pads impregnated with diamond are used with water for lubrication. Starting at a grit of 50 then 100 etc until he reaches 1500 or maybe even finer........the coloration in Gerard's stone is awesome, with a high polish it will be a stunning sculpture. 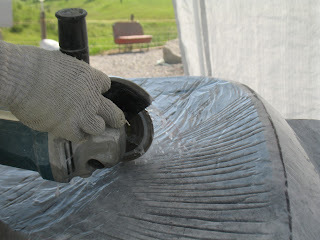 When the weather is cloudy we can remove the tents. Chien is standing on his sculpture checking that his perspective from the ground is not distorted. It is important to check and recheck many times, especially when the piece is oriented differently from how it will stand when complete. Paul has pretty much finished with this surface. The stone has been laying in this orientation for two and a half weeks now. Today we will turn it so that he can start to work on the back. The surfaces on the sides are done and textured. Dave Casselman from Olds TV was on site interviewing Carlos. 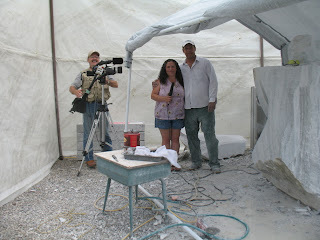 He is doing a half hour piece on each of the sculptors this year. 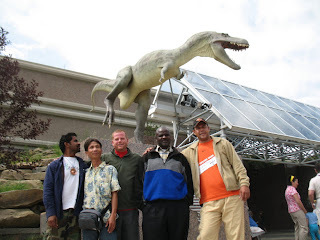 Last year he made a one hour show, you can see that at http://www.casselmanscanada.com/ Dave's shows are about people and things in western Canada that are interesting, check out some of the other episodes he has done on local attractions. We started the morning off by putting a new blade on the big saw. 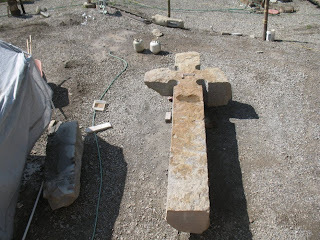 The first cut was made with it on one of Chander's columns, it cuts really fast and as it is heavier than the old one we had to replace the rocks in the counterweight bucket with steel, steel is almost 3 times as heavy as stone. As the saw moves down in the cut the weight on the blade increases and will bog the motor out so a little weight is added to the bucket as the cut is made. We are using old railroad spikes found along the tracks, it's just about right to take out two at a time. 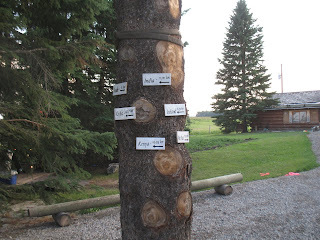 This evening Uptowne Olds business organization and Prairies 2 Peaks Tourism Association sponsored a gala reception at Centenial Park in this town 50 km east of the sculpture site. 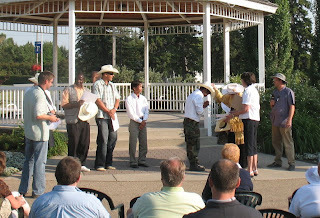 A representative from Calgary Tourism attended and performed a "White Hat Ceremony". 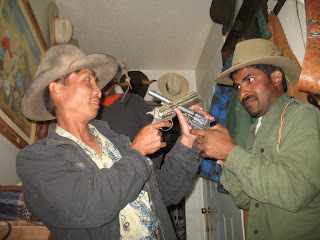 After reciting a pledge to spread western hospitality where ever they go and giving a big western whoop each sculptor was presented with their own white cowboy hat. They also recieved certificates bestowing them with honorary citizenship of the City of Calgary. Representatives from Mountainview County, Travel Alberta, Olds mayor and council along with about 50 arts supporters from the community. 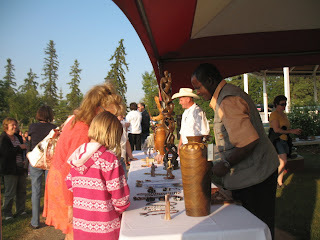 The sculptors thouroughly enjoyed the evening and enjoyed visiting with people who came. Dave Casselman was on location making footage for the Casselman's Canada episodes that are being produced. 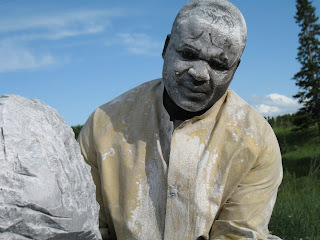 He produced an hour long documentary in 08, this year he is doing a half hour show about each of the sculptors. Thanks so much Dave, these will be treasured mementos for the sculptors and great that they are be available at http://www.casselmanscanada.com/ CDs of these episodes are available at the symposium and on Dave's website if you would like to collect them. 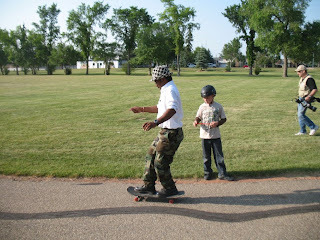 There was time for a little fun too, Chander Chien and Gerard gave skateboarding a try. It all ended with the young fellow that owned the board calling a stop to the melee and giving them a lesson. Chander and Chien got along pretty well pushing each other on the board while the other sat on it cross legged. 1. To allow sculptors to make the acquaintance of other participating artists. 2. Sharing of cultural norms, provide the public of the surrounding area an opportunity to become familiar with the tendencies of modern sculpture. 3. To promote the participating sculptors and the strengthening of international relations. 4. 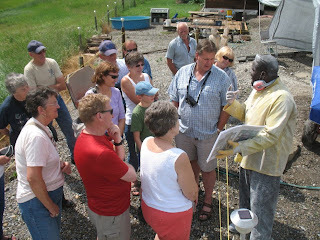 To demonstrate the community and economic development opportunities that art provides. July 28, Bergen Rocks 09 We took a break on Tues, 28th and made a trip to Banff. The weather was not great but when we rode up to the top of Sulpher Mountain it opened up for about 15 minutes. 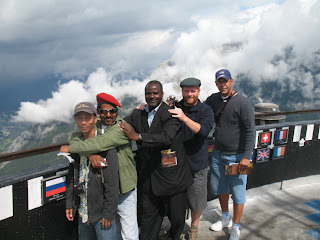 The view was great and the ride up in the cable car was a thrill. 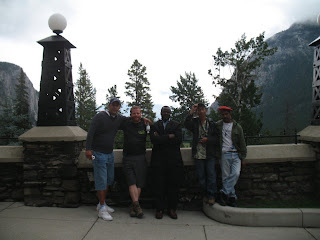 We visited Banff Springs Hotel, it is an incredible building in an awesome location. Although it was cool all day we had a great time, visited several galleries and of course picked up "Canadian" items to take home. "Spring", Chiens piece is taking on a recognizable form. There is a large slab to cut off after it is rolled over, and a lot of cutting and polishing to do over the next two weeks. We're half way there now. 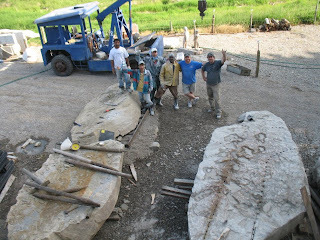 A delegation from an Alberta city spent a couple of hours at the site on Monday. They were impressed and excited about the symposium and feel that thier town would benefit from having an event themselves. We are excited that this event may foster others, besides having a great time we are achieving other stated goals--to stimulate other symposia and to place art in other communities is a result we have aimed for from the start. Groups from a few other towns and a college in Alberta will visit before the end of Bergen Rocks, it would be wonderful if there will be a couple of other sympposia next year along with Bergen Rocks. The sculptors often take a break when there are several people on the site. Gerard is explaining his work and showing pictures of others he has done in other countries. Last year one of Gerard's sculptures won the gold medal in the Bejing Olympics sculpture competition which included artists from many other countries of the world. The other participants have equally impressive credentials. It still amazes me that we have artists of this calibre visiting Bergen, and many others that would love to come in the future. 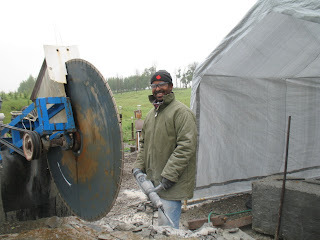 Chander is ready to cleave an end off of one of his columns after cutting with the big saw. The blade is almost worn out completely now, another is ordered and we are hoping it will be ready soon. The owner of the local GM dealer is a strong supporter of the arts, he allowed us to put this banner up during the symposium. As local support grows the word about Bergen Rocks will spread. Apparently this is the only grass roots symposium in the world, where the artists get together on thier own. Big thanks to Ed Morgan and Sundre Motors for the letting us hang our banner there. The weather has been really nice, a little too hot for this hard work. 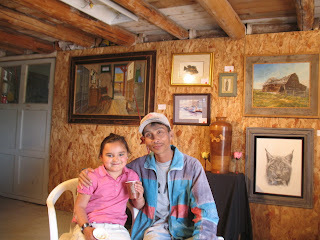 When we take breaks it is often in the barn where the art show is installed. Chien and volunteer, Jayda Pinder from Chestemere, have a sip of lemonade. The barn is nice and cool and it is wonderful to relax for a few minutes there and enjoy the art work too. Gerard has worked both sides of "Desire to be". 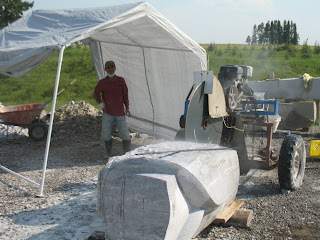 On july 27 we stood it up, more shaping and a lot of polishing remains to be done. 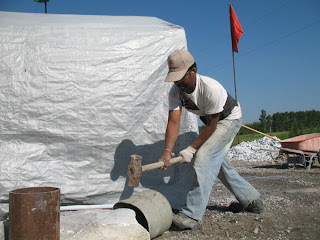 Atti2ude Club member Alejo Lozano from Columbia helps to prepare the site and place the stones. 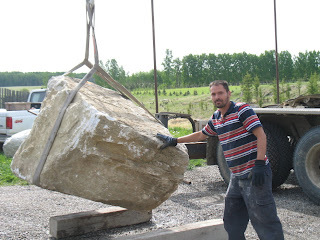 This is Carlos stone, a lot larger than it looks, about 6 tonnes. Finally everyone is here, (left to right) Chander, Chien, Carlos, Gerard, Paul and Mark Stuthiet. 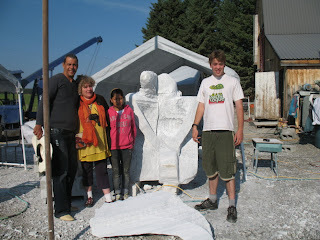 Mark is an Alberta sculptor who I worked with on the Canadian team at "Fete d'hiver" a few years back. 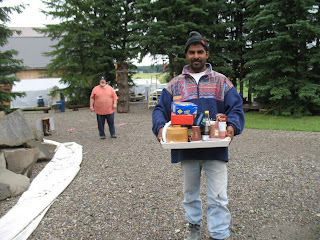 The sculptors came in over 5 days, we made a trip to Calgary on Sat, Sun, Mon, Tues and Wed to get them all. Each one started on his stone the day after getting here. I had plans for the days leading up to the start so things are a little behind on the site but I think it will all be pulled together by the opening ceremony on Saturday. 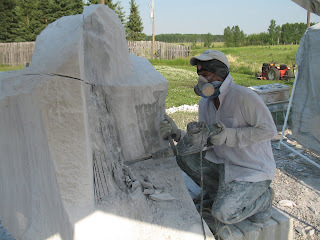 Carlos thinks the weather in Alberta is perfect for sculpting, well in the summer it often is. We have encountered some issues with Carlos stone, something that happens at symposiums and creates a need to adapt, be creative and flexible. If it was a commission you would simply get another stone, at a symposium that isn't usually nessecary except in the case of catastrophic material failure. It is fun and interesting, and challenging to create a pleasing form from "your stone" Chander wrote to me a few days before he left India to send him a picture of his, he said "I miss my stone" There is a kind of bond that grows between the sculptor and the material, stone, wood and snow often have internal defects that make it nessecary to modify your work. This is exciting, it is as if the material is dictating the final form, that you are working together with it. Often it leads to something interesting that you did not think of doing. 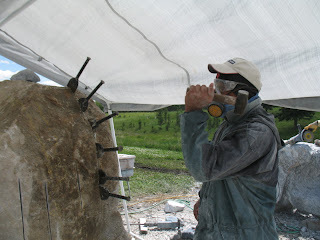 After cleaving a large piece from the top of his stone (wedges are inserted into the drill holes and tightened until the stone "cleaves") Chien is cutting "frets" to be chiseled off . 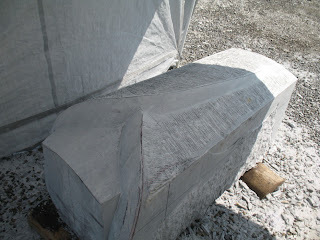 Due to the wedge shape of the piece to be removed the smaller end didn't come off with the bulk of the cleaved block. 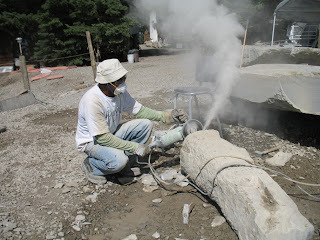 Paul is grinding a connecting line between the drill holes to be sure that when he cleaves the stone the cut will be as straight as possible. Gerard always looks a little whiter at the end of the day, seems like the guy lives on that marble dust. As this is a small symposium we don't have extra helpers on hand to help out the guys all of the time. 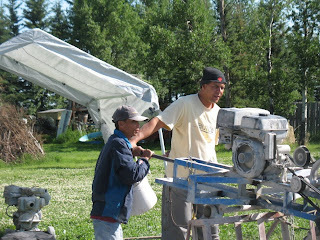 Here Chien and Carlos work together with the big saw. 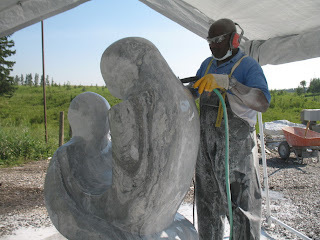 This really creates a bond between the sculptors, having contributed a little to everyones work is satisfying and creates memories that will last forever for us. 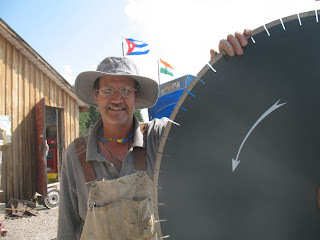 Chander is cuts the form of one of the bells for his project with the angle grinder. 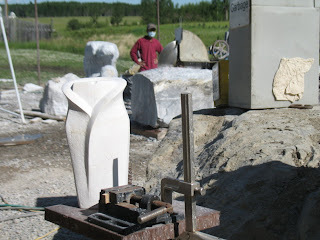 He is working on several elements of his sculpture at the same time.....two columns, a header and two bells. 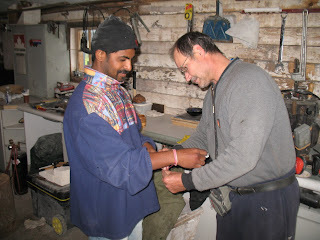 Stephen Turner, Atti2ude Club volunteer, helps Chander with cleaving the block he will use for the two columns. Each piece weighs approximately 6000 lb. Chiens model sits near his work area, sculptors refer to a model or sketch regularly to avoid making a cut where it is not wanted (oooops). 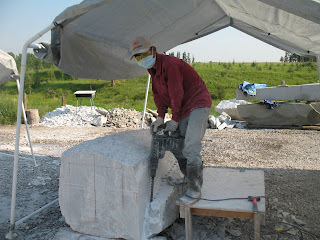 After making cuts with the big saw many chisels are inseted and tightened progressively tow "cleave" off large pieces. 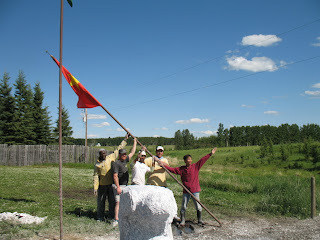 On the 20th we stopped in the afternoon and raised the flags. 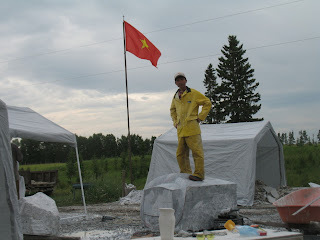 Everyone helped with each one, this is the Viet Nam flag going up, Chien in front in a classic Vietnamese pose. After the flags went up the participants each sang their national anthem. The site looks great with the flags of five countries flying over our work. We went into Calgary on our first Tuesday off. 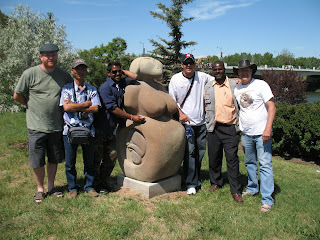 There is a nice group of sandstone sculptures along the bank of the Bow near the Greyhound station. They are really hard to park and get to, you have to cross a couple of streets where there aren't any crosswalks....The 14 street bridge is in the background. Our trip had two purposes, to tool up and see some art around the city. 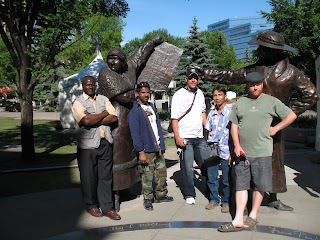 This sculpture of Nelly McClung and other women from the womens rights movement is along Stephen Ave Mall. 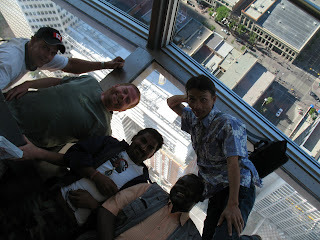 The last stop was the Calgary tower. Too bad it was cloudy, we couldn't see the mountains but it was a great view of the city. We spent about 1/2 hour up there, Carlos didn't trust the glass floor. Rhonda Barber took time to give us a great tour of the Triange Gallery at City Hall. Part of an kinetic installation by sculptor Katie Ohe is shown in front of us. Everyone got a lot of work done today, including me. I was so busy I forgot about taking pictures until Paul had decided to shut down and clean up for tommorrow. The pressure washer does a quick job of that. 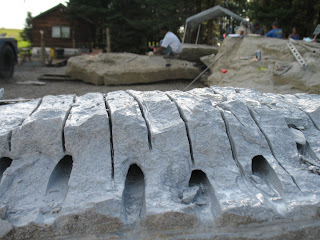 Carlos has taken a lot of material from back of his sculpture today and on Monday, now the form is begining to show. He has a long way to go and the stone is very hard but we are only slightly over a week into it now. Incredible what can result over only a month, I hope more people get out to see these art works develop. 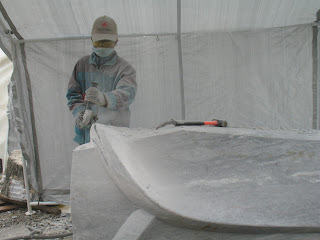 Now that the top surface is roughed in Chien is working on the sides. He made a saw cut and cleaved the top half off and now he's drilling and will cleave off the bottom. This process will be repeated on the other side, you can just barely see the sawcut on the other side. 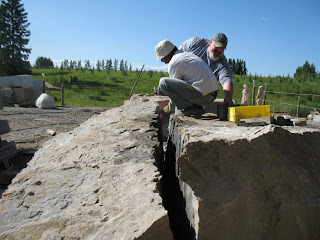 We had to move one of the stones Chander cleaved off on Monday to let him work between the two. Improvisation is nessecary when you don't have exactly what is needed for equipment. 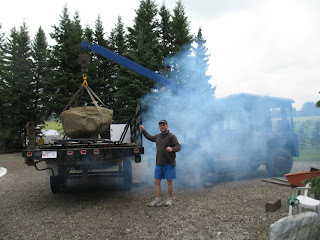 First we lifted the stone and put rollers under it. Then we placed a chive under the front of the crane and ran a chain through that to the hook. 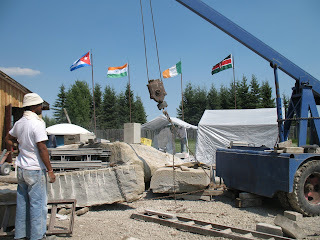 By pulling up witht he crane we could pull the stone forward. The form of "Desire to be" is developing very fast. The cuts that Gerard makes are getting smaller and smaller now as he is working toward surfaces he will detail or polish.